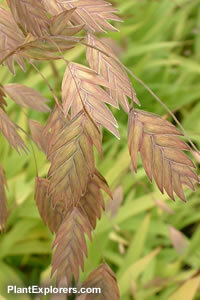 This perennial grass has lance-shaped, arching green leaves and bears oat-like panicles of ovate green spiklets in summer. Height 3 feet; spread 2 feet. For maximum freshness, please keep seed refrigerated in its original packaging until it is time to plant. Sow seed in containers in a cold frame in spring. Grow in fertile, moist but well-drained soil in sun or part shade. Cut down in late winter.